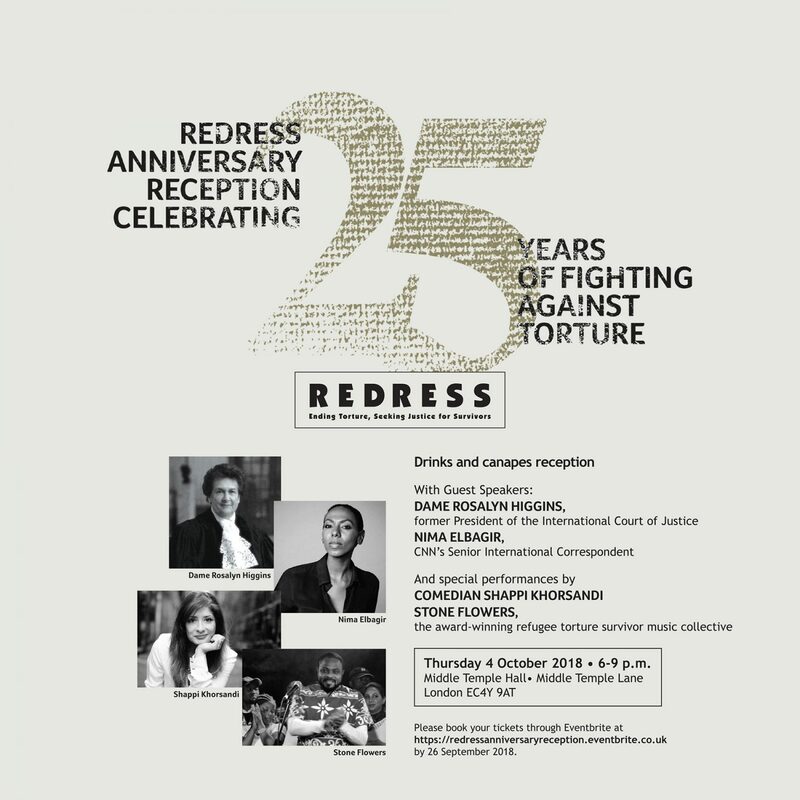 To mark its 25th anniversary, international human rights organisation REDRESS is hosting a Reception to celebrate its role in campaigning for survivors and against torture. The Drinks and Canapes Reception will be held at the historic Middle Temple Hall in London and is open to all those interested in REDRESS’ work. The event will offer a unique opportunity to gain insight into REDRESS’ work and the real impact of torture on survivors, families and societies. Dame Rosalyn Higgins, the first female judge ever to be elected to the International Court of Justice and its president from 2006-2009. Renowned comedian and writer Shappi Khorsandi, author of ‘Nina is not OK’ and ‘A Beginners’ Guide to Acting English’. Stone Flowers, the award-winning refugee torture survivor music collective composed of survivors who have fled war and violence in their home countries. The Stone Flowers have recorded two studio albums and toured across the UK including Manchester Academy, Amnesty HQ, The Bridgewater Hall, Rich Mix as well as supporting Paloma Faith, Peace and Kate Tempest. Several of REDRESS’ clients will share their experiences at the event, including Richard Ratcliffe, whose wife Nazanin Zaghari-Ratcliffe is in prison in Iran, and Yemi Hailemariam, the partner of the Ethiopian activist Andy Tsege, who was released earlier this year after four years on death row in Ethiopia. Please book your tickets by 26 September 2018 through Eventbrite here. If you cannot join, but would like to support REDRESS, please consider leaving us a donation on Eventbrite. As all our work is without charge, we rely on the generosity of supporters like you to continue achieving positive judgments and outcomes for torture survivors that can have a long-lasting impact in their lives. If you have any questions, please contact Eva Sanchis, REDRESS’ Head of Communications, on [email protected] or 020 7793 1777.